Close your eyes and picture yourself in exotic lands, where the warm breezes carry with them the aromas of frankincense and spices. Then, picture yourself in a completely different world, living among powerful rulers in a land where palaces stand, beautiful and mighty, lavishly furnished with bright silk, elaborate artwork, and finely-carved furniture. Can you picture that? Those are some of the marvels that the thirteenth century Venetian explorer, Marco Polo, came across on his expeditions to Persia and the Far East. Marco Polo is my hero. And just why is he my hero? Well, simply because I am fascinated by adventures, and Marco Polo’s experiences were absolutely remarkable. I must admit that I’m green with envy for what he was able to do. The story starts when Marco and his family traveled through the Middle East and into China, where they were welcomed by the formidable Chinese Mongol ruler, Kublai Khan, the grandson of the famous Genghis Khan. This was the first time Marco had ever been in such a place. Upon meeting him, Kublai Khan took an instant liking to Marco, whom he found to be an excellent conversationalist. The khan favored Marco so much, that he sent him on various diplomatic missions throughout his vast domain, and even gave Marco a post in a large industrial city called Yangzhou. Not only that, but Marco would entertain the khan with stories about the lands that he had been to, which transfixed the ruler, no doubt. Marco Polo and his family spent the following 17 years in China, being sent on the diplomatic missions mentioned earlier. 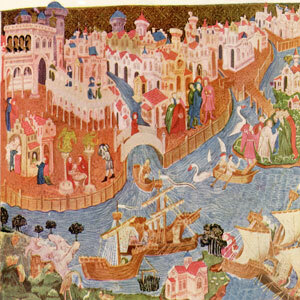 Towards the end of their stay, Marco Polo and his family requested that Kublai Khan allow them to return to Venice. Kublai Khan declined, not wishing his intriguing guests to go. The Polos continued to request that the khan bid them leave, but the potentate denied them still. It was in 1292 when Marco Polo and his family were allowed to return to Venice, so long as they obeyed Kublai Khan’s final orders to them, which were to accompany a Mongol princess and ensure her safe travels to Persia. The khan wanted them to do this because the princess was to be married to Kublai’s kindred, which were the rulers of Persia, and he most likely wanted to remain on good terms with them. The Polos completed their mission successfully, and arrived in Venice in 1295. 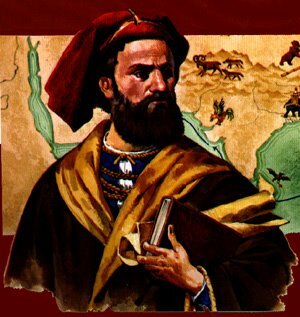 Marco Polo became famous for his expeditions. At one point in time, he was jailed as a prisoner of war, but fortunately, he had a cellmate who was deeply interested in Marco’s travels. His cellmate wrote a book containing the vast majority of what Marco Polo had done as he traveled to and lived in China. The book became quite popular, and set an example for many other explorers. Eventually, Marco Polo was released from prison and was allowed to return to Venice. Hopefully, he lived out the rest of his life peacefully until his death in 1324. What makes him a hero to me is not only that he had one of the most marvelous adventures that I’ve ever heard of, but that he dedicated his life to exploration and diplomacy. He paved the road for future explorers to the Far East (although it would be a couple more centuries before Europeans returned). If only I would be lucky enough to do something like that too! LibraryThinkQuest.org - Read more about this famous explorer and adventurer. 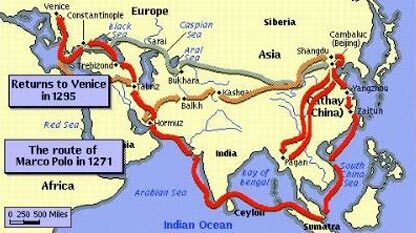 Silkroad Foundation - "Marco Polo and His Travels"